Everyone knows who the first person was to detect radio signals from outer space. It was Karl Jansky working at Bell Labs in August 1931. Jansky's antenna was designed to receive at 20.5 MHz and was mounted on four tyres from a Ford Model T that enabled it to be rotated. 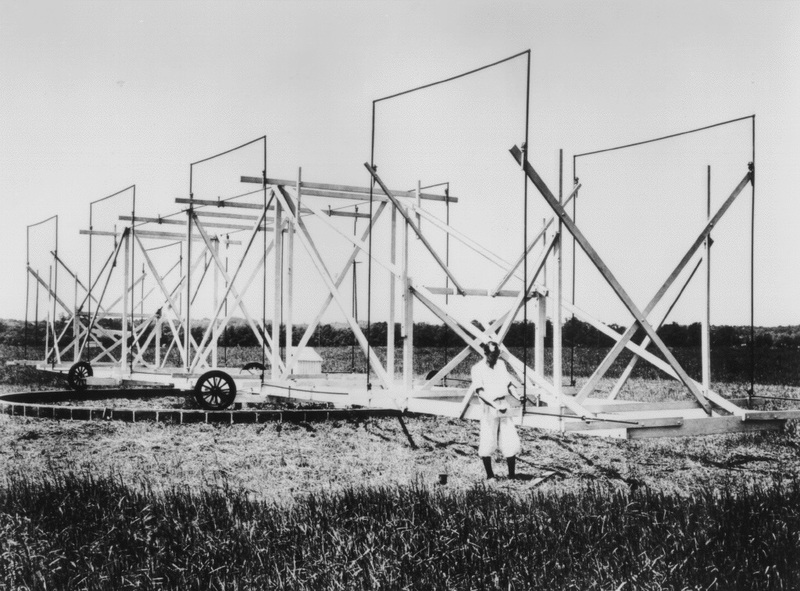 However, Jansky's radio telescope (nicknamed Jansky's merry-go-round by his colleagues) was not the first radio telescope. Thomas Edison tried to constructed one in 1890, also in 1894 Oliver Lodge built a radio telescope to try to detect solar radio waves but at the wrong wavelengths. In 1896 Johannes Wilsing and Julius Scheiner also tried and failed (Ann Phys Chem, Vol 59, page 782). In 1900 Charles Norman built an antenna on Mount Blanc and came tantalisingly close to detecting solar radio waves but he was ultimately unsuccessful because he tried to detect radio signals during a solar minimum. Also Norman's detector was at 2 to 3 MHz so was a little on the low side (Comptes Rendus 1902 Vol 134, page 273). If Norman had either changed his detection frequency or had repeated his trial on a day with a higher solar activity he may well have succeeded in his attempt. 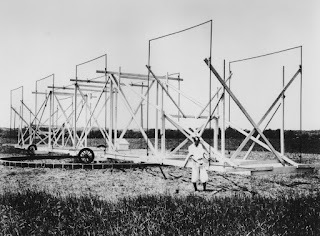 The history of early radio astronomy has been well documented by Woodruff T. Sullivan in his 2005 book "The Early Years of Radio Astronomy" (http://www.cambridge.org). A problem was that not everyone agreed that radio waves were coming through the Earth's atmosphere from space and that the signals being detected by radio telescopes on Earth originated in space and not from effects in the Earth's atmosphere. A radio map of the sky at 21 MHz shows only very poor correlation with a visible map of the night sky. It was only in 1955 when radio signals were detected from Jupiter at the Carnegie Institute in Washington DC that radio astronomy was taken completely seriously. This event is so recent that it is in living memory. Galileo's findings with his telescope were initially dismissed as being due to poor instrument optics and his overactive imagination. However, Galileo was confident about his telescope design and "Sidereus Nuncius" contains an adequate description of how to construct a similar device to Galileo's. Had John Dee, Thomas Digges, Leonard Digges or Thomas Harriot pointed the Digges-Bourne perspective glass towards the night sky (which I am sure one of them must have done) what would they have seen? Venus as a glowing sphere, blemishes on the surface of the moon, two or more moons of Jupiter, stars invisible to the naked eye and just possibly an elongation of Saturn. It would have easy for critics to dismiss any observations made with the Digges-Bourne perspective glass as device artifacts just as happened initially with Galileo and more recently with radio astronomy. However, stars invisible to the naked eye going off to infinity, Venus as a glowing sphere and a optical device that shows a clear image if looked at one way but from another viewpoint shows an confused unintelligible blur. References to these can all be found in Shakespeare's plays (Hamlet, A Midsummer Night's Dream and Richard II respectively). Would educated theatre goers have understood these references or is it just pure coincidence?